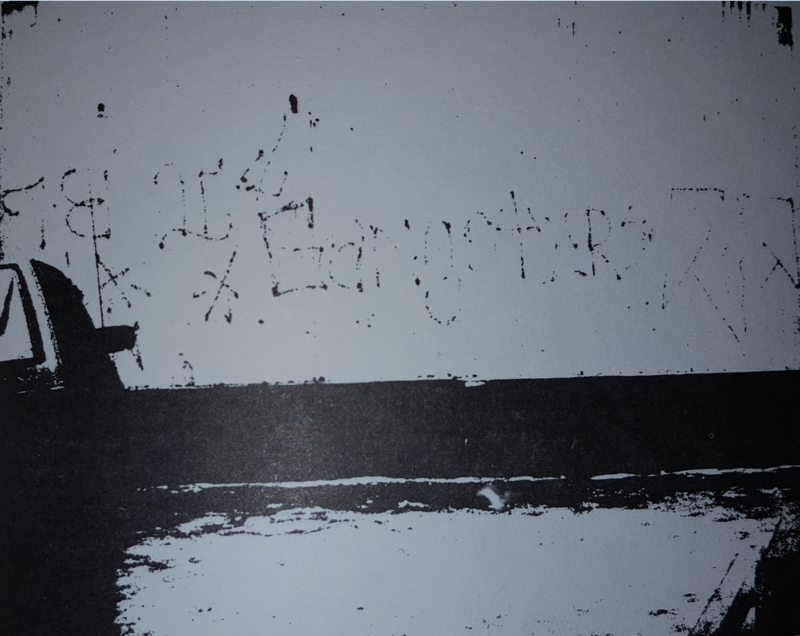 The Imperial Gangster story is in two parts with two separate gangs that called themselves “Imperial Spanish Gangsters.” The Imperial Spanish Gangsters were founded by “Spanky.” Each club was from different neighborhood but had the same struggles as each other. 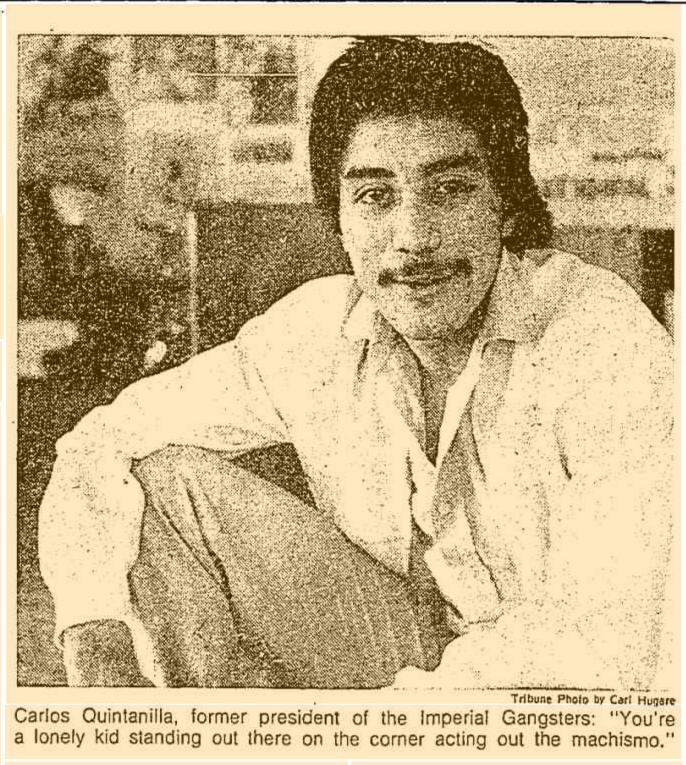 The first Imperial Gangsters gang started in 1964 in the West Humboldt Park neighborhood at the intersection of Grand Avenue and Central Park Ave. The members of the club attended James Russell Lowell Elementary School at Hirsch and Spaulding (3320 W Hirsch St, Chicago, IL 60651). This put them in direct conflict with the Latin Kings from Division and Spaulding that were just blocks away from the school. Eventually in the mid -1960s the IGs started growing over by Cameron Elementary School at Grand Ave and Division Street making the Imperial Gangsters a force to be reckoned with. By the later 1960s, these Imperial Gangsters were attending Charles A. Prosser High School located in the Belmont – Cragin neighborhood right by Hanson Park at Central Ave and Grand Ave. The next part of this story goes back to the year 1969 in the Logan Square neighborhood at the corner of Armitage and Drake. Logan Square was mostly a white community but the “white flight” was starting to become a phenomenon in this neighborhood as Puerto Rican people were moving in. 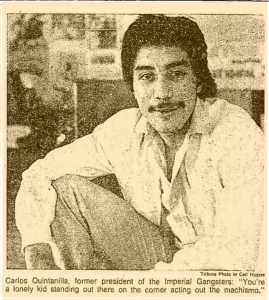 Around the holiday season of 1969 The Imperial Gangsters and Imperial Spanish Gangsters came together as an alliance called the “Imperial Spanish Gangsters” adopting to Spanky’s organizational name. the new meshed club adopted the colors black and pink and the rounded crown to separate themselves from the Latin King’s crown. The Imperial Gangsters from West Humboldt Park became known as the “Cameron Gangsters” and made Cameron Grammar School their most celebrated territory. “Spanky” was only in command all the Imperial Spanish Gangster alliance in both Humboldt Park and Logan Square from 1969-1971. In 1971 “Godfather” took over leadership of the alliance. Carlos Quintilla. Image from Chicago Tribune December 12, 1979. 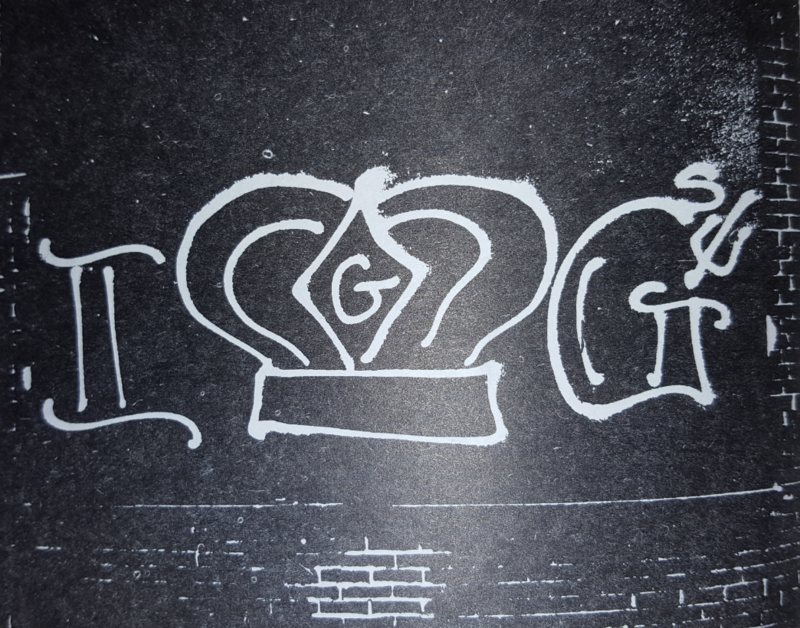 From a 1980s Chicago Police handbook, the pitchfork was used back then. In the year 1972 the Imperial Gangsters of Logan Square became heavily influenced by the movie “The Godfather” that came out that year. These high school kids would visit “The Armitage” which was a theater that existed at 3553 W. Armitage Avenue which was right on the corner of Armitage and Drake where the IGs first started. Under the leadership of “Little Mexico” the IGs were able to establish a relationship with the theater’s owner and offered protection from rival gangs in the area just like what the Mafia does. The IGs acted as ushers in the theater and there were often 50+ members seen in the theater. IGs also started dressing like Italian gangsters wearing the long coats, Al Capone shoes, the long coats with the white scarfs and they even twirled around canes. “Little Mexico” also wanted his members to have guns, so now every member at least carried a small pistol (Chicago Tribune, Keegan, P 1, Dec 12 1979). “Little Mexico” and the leadership of the Imperial Spanish Gangsters held a meeting at The Armitage movie theater one day in 1972 to discuss fully merging Imperial Gangster and Imperial Spanish Gangsters into one organization just known as the “Imperial Gangsters.” Now there were about 200+ Imperial Gangsters on the streets of West Humboldt Park and Logan Square. There would still be separate leadership for each faction; however, they were now under one name and one organization. Around the time of this merger the IGs now were offering protection to a cleaners and a restaurant that offered them free stuff and free services. 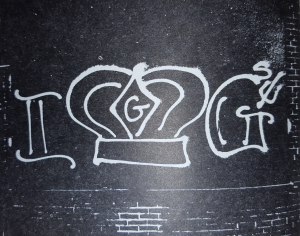 This success that the IGs were coming across was soon met with envy from the powerful Latin Kings street gang. The Latin Kings wanted to be the only Puerto Rican street gang in all of Humboldt Park and now they were spreading into several more north side neighborhoods including Logan Square this eventually brought the IGs into a full scale war with Latin Kings. Imperial Gangster’s biggest enemies were now Latin Kings, Gaylords and Simon City Royals. In 1973, “Little Mexico” was now 17 years old and was about to have a child; therefore, he left the Imperial Gangsters gang life and went to college then went on to work with gang members helping them to turn their lives around. After Little Mexico left, “Mad Dog” took over in 1973, and he ran it until he was imprisoned in 1975. In the mid-1970s, the IGs opened new territory at Sawyer and Armitage in Logan Square and North Ave and Hamlin in West Humboldt Park. This was also the point in time when Gaylords and Latin Kings were getting really large in size in IG territory, these gangs were becoming giants. The IGs had something in common with the Latin Disciples (MLDs), Spanish Cobras, Latin Eagles and Orquestra Albany, and that was that they all hated Latin Kings and were all outnumbered by Latin Kings. These gangs began drawing closer to each other until they became pretty tight by 1978. 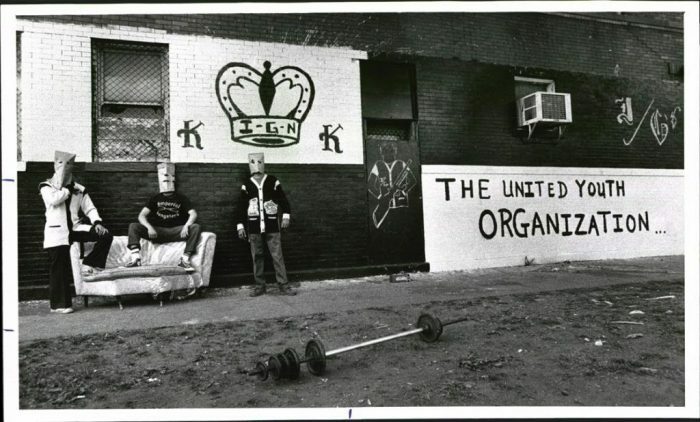 The in year 1978 these gangs created the “United Latino Organization” (ULO) which unified these street gangs against Latin Kings and the rival “UFO” which consisted of 5 large white gangs that included the Gaylords. In the same year 1978 in April, the Imperial Gangsters joined the Folk Nation alliance that was created behind prison walls. Spanish Cobras, Latin Disciples, Latin Eagles all had joined this alliance so it was a perfect fit for the IGs. In the late 1970s Latinos were beginning to colonize the neighborhood of Hermosa especially by Kelvyn Park and this brought IGs to the neighborhood. The Spanish Cobras were beginning an attempt to take over Kelvyn Park but assistance was greatly needed because the Gaylords and the Young Freaks (Stoned Freaks) were battling Cobras back. Imperial Gangsters had already attended Kelvyn Park High School and were fighting with white gangs that went there now IGs were moving into the neighborhood. In the 1980s and into the 1990s the IGs opened territory in Hermosa, Irving Park, Albany Park, Wicker Park, Ukrainian Village, Belmont – Cragin, Marquette Park and Brighton Park. The IGs also opened in some suburbs like Cicero, Franklin Park, and were the first gang to arrive in the suburb of Bensenville in 1982. By the early 1990s the IGs were engaging in several interalliance gang wars especially with Maniac Latin Disciples and Spanish Cobras. In between 1991 and 1992 MLDs, IGs alongside Latin Eagles and Spanish Cobras began engaging in a three way war which led to the creation of three sub alliances within the Folk Nation. The “Insane Family,” The “Maniac Family” and the “Almighty Family.” The Imperial Gangsters was a part of the “Almighty family” when it first formed in 1992 and still held an alliance with Simon City Royals and North Side Insane Popes as they joined the Almighty alliance as well. With the IGs in the midst of more gang wars and facing more incarcerations the IGs withdrew their troops out of Brighton Park and Marquette Park. The south side was not their home anyway and they were cut off from a lot of support from either allies or the rest of the nation so the south side needed to be closed up. The IGs did open solid territory in the suburb of Franklin Park “The Jungle” in the 1980s; however, the Cicero chapter had to close down by the late 1980s but Franklin remained strong. Other than that, the IGs had not lost too much territory over time and had kept the vast majority of their Logan Square turf. Some sets in Logan Square had closed along with Ukrainian Village and Wicker Park because of the gentrification that brought many yuppies and hipsters to IG neighborhoods, but the gang still remains strong in Logan Square.